To reach another person on the Internet you have to type an address into your computer — a name or a number. That address must be unique so computers know where to find each other. ICANN coordinates these unique identifiers across the world. Without that coordination, we wouldn’t have one global Internet. In more technical terms, the Internet Corporation for Assigned Names and Numbers (ICANN) helps coordinate the Internet Assigned Numbers Authority (IANA) functions, which are key technical services critical to the continued operations of the Internet’s underlying address book, the Domain Name System (DNS). The foundational tools and infrastructure that make the internet work, such as DNS and undersea fiber optic cables, are often overlooked or not well understood by the public at large. We were struck by how this overlooked technology motivated a relatively small group of people to build and grow something as important as an organization like ICANN. (Photo – Paul Wilson talks about Jon Postel, who was instrumental in ICANN being established and becoming what it is today.) Just two years ago the handover of IANA from the US government to ICANN was completed, and ICANN continues to move full steam ahead, solving important and critical issues related to the coordination of unique identifiers. As network and internet providers in this community, it was good to learn more about the policy side that helps keep the internet organized, the ideas that drive our business forward, and make our work possible. At their core, ICANN gatherings are a meeting of the minds. On the policy side, we learned about the GDPR process and how it has impacted registrars, about ICANN’s budget and five-year planning, their new vision statement, and more. As engineers, we focused our learning more narrowly on the technical track of the meeting. Part of ICANN63 was a smaller gathering of the ccnSO (Country Code Names Supporting Organisation). NetActuate’s Greg Wallace presented to an audience of over 100 about Anycast, Peering, and Sinkholes. This talk focused on what to do when a network is anycasting over internet exchanges, and experiences a sudden, unexpected shift of network traffic to a different part of the world – such as a user request from Germany being routed to South Africa instead of France. DNSSEC (Domain Name System Security Extensions), are a way to address this threat. Although everyone knows that DNSSEC is critical, adoption has been slow for a number of both business and technical reasons. 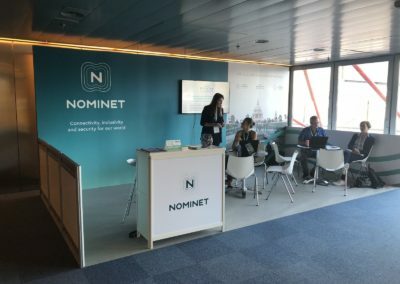 During our time at ICANN63, we had a chance to meet with our customers and spend time learning more about their new products and services. At NetActuate, our goal is to provide foundational services that empower our customer’s platforms, connecting their products and services with the lowest possible latency to communities around the world. It’s amazing to be a trusted connectivity and infrastructure partner to so many different businesses, each with their own unique approach to solving their customer’s problems, and delivering world class service.